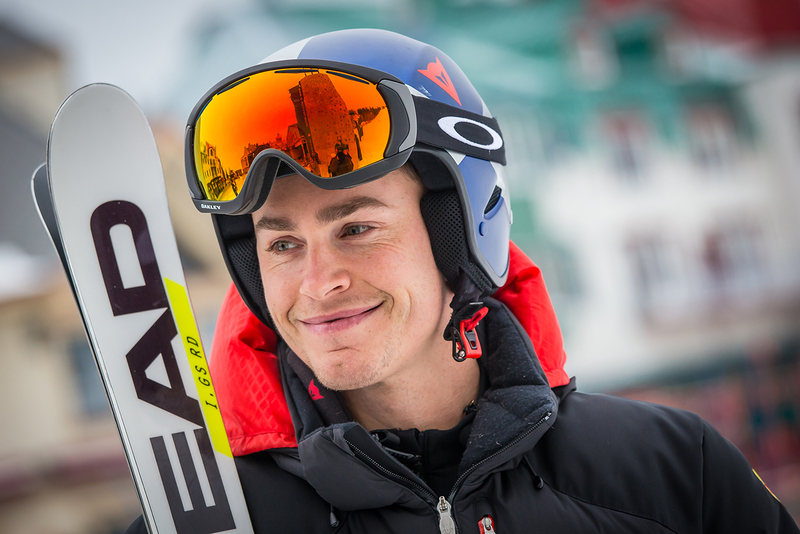 Erik Guay, who recently announced he would not pursue his downhill ski season because of a knee injury, joined us last week for tea and a chat. We took advantage of the athlete’s presence in his hometown to learn a little more about his current situation, his family life and more. We also included your questions, asked via Twitter and Facebook, to our conversation! T- Now that you are at home, are you enjoying your winter in Tremblant? E- For sure. I’m using this time to rest, but mostly to spend time with the family. We do a lot of snowshoeing and skating with the kids. My parents have an ice rink at home and the girls love to skate there. We also ski as a family, when classes are over. You should know that I’m a bit hyperactive. I can’t do zilch with my day or else I get grumpy! Winter goes faster when you enjoy it, so I do outdoor activities as much as possible. I tried the fat bike recently and I really enjoyed it, it was a nice challenge! Now I’m back into stationary biking to strengthen up so I can do it more often. T- How is it to live in a house full of girls? E- It’s very princess and pink everywhere! T- And how do you spend the summer? E- In the summer, I mainly concentrate on road biking. Maybe I’ll even race an IRONMAN one day. I’m pretty good at running and cycling, but I’ll have to work on the swimming. Skier’s legs don’t really float! Otherwise, I enjoy the vicinity of Tremblant: Montagne Verte for trekking, Rivière Rouge for kayaking, etc. In my other current projects, I am taking aircraft pilot solo classes. I would like to fly the family to our ice fishing camp in northern Quebec. The girls are impressed by ice fishing. For them, it’s like magic, the fish come out of nowhere! Twitter Question by Lynn Lefebvre: At what age did you know you wanted to become a professional skier? E- I started skiing at 18 months, but for a long time I was involved in tennis as much as in skiing. I only chose skiing at age 12 and it really got serious for me at around 15 or 16. At 18, I decided that I was aiming for the World Cup! T- Do you want your daughters to follow in your footsteps? E- I do not necessarily want my daughters to go into ski competition. I would like to discover something new with them, unless that is really what they prefer! For now, Logann (oldest at 6 years) already plays tennis and golf, does gymnastics and skiing, and even recently started ballet. She really wanted to wear a tutu! I don’t think it will last very long though; she doesn’t really adhere to the strict side of this discipline. Facebook Question by Rene Bergeron: When do you think you can go back to competing? E- If all goes well, I plan to be back to ski racing by the month of June. Starting off with a few weeks of training, probably to be held in Chile. T- Chile vs Europe, which region do you prefer to ski? The snow conditions are similar in both regions, but in Chile a descent can take 1 minute 30 seconds versus Europe where it takes 40 to 45 seconds. Both regions have their advantages and disadvantages. T- 60 pairs of ski! And what about the rest of your equipment? E- Three pairs of boots. I have a primary pair of boots and others are for testing or in case of break. I like to try new helmets too. Before they were tested at speeds of 15km/h, now it’s 160km/h. Every year the manufacturers invent new technologies in protection and I like to get involved in product testing. A new feature, which we’re likely to see on the race circuit next year, is the neck airbag. The next step will probably be airbags for the knees. Facebook Question by Susie Sicotte: What superlative word would you use to describe the perfect run? E- Confidence. The perfect descent does not exist, but the best descents are more fluid and full of confidence. T- Have you ever been afraid of a descent? E- No, I’ve never been afraid, but I already felt less assured. The only time I’ve been a little apprehensive is precisely when I lacked confidence, after a fall or a shutdown period. T- After a season without competition, is it going to be difficult to regain confidence? E- It will definitely take a few takes to get back in the saddle, but it will come back quick enough. Facebook Question by Susie Sicotte: At what age professional riders are at their best? E- The age at which one is best depends on the ski racing type. In the slalom races, the ones who excel are around 18 to 25. Right now, the best in the world is 24 years old. This course is quick to get good at and requires a lot of agility. In downhill, the top players are usually aged between 32 and 36 years old. You have to know the course well and experience is a big advantage. With age, we tend to take more chances and you’ll find that the winners are those who take risks. Super-G is like an in-between. T- Do you have any advice for young people who want to follow in your footsteps? E- Don’t get too comfortable. Try to surround yourself with athletes who will push you to perform: better skiers, skiers with more experience… If you’re constantly in the top of your class then there is no more motivation to progress. 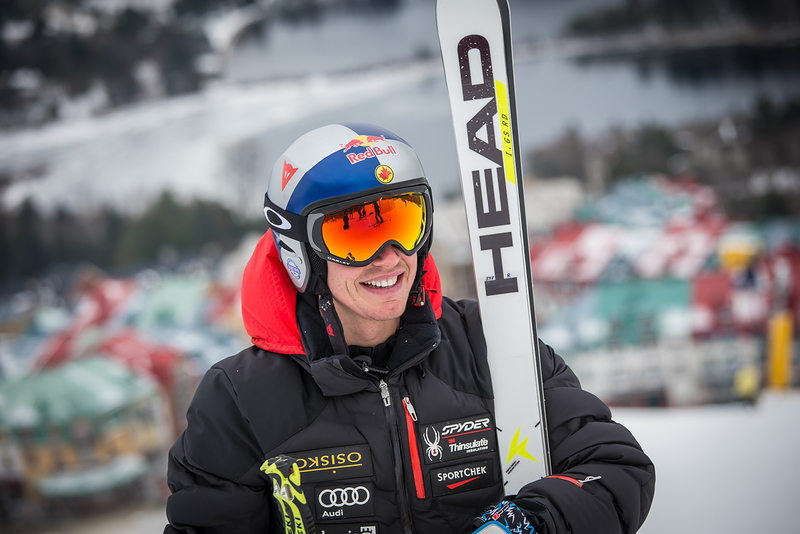 Twitter question by Daniel St Pierre via @MontTremblant : What mental tips would you give to snap out of a bad day when it feels like you’re on someone else’s skis? E- Every day is a learning opportunity. Learn from the negative experience and use it! T- Finally, one last question from us! What is your favorite run at Tremblant? E- It’s clear that I love the Erik Guay run! But my favorite slope is the Jasey-Jay Anderson. This run is a little calmer and I like the terrain changes. I often practice there. 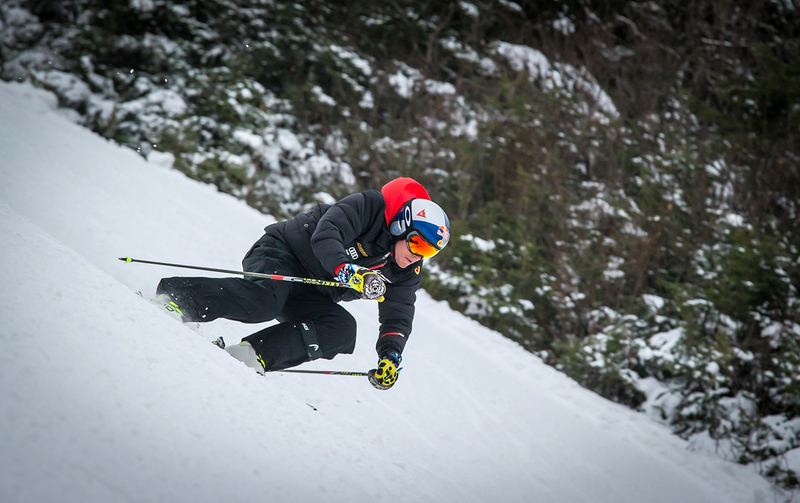 Big thanks to Erik Guay for taking the time to sit with us for this interview. Looking forward to seeing you back in action!